Knock your next family movie night out of the park with the release of Jurassic World: Fallen Kingdom now available on Blu-Ray. With more thrills, adventure and dinosaurs than ever before, turn down the lights, grab some popcorn and hold on for a ride 65 million years in the making! I can still remember seeing the original Jurassic Park as a teenager. There had never been a movie that had that much of an effect on me. With the use of groundbreaking CGI, those dinosaurs looked so REAL! It was above and beyond anything my imagination could conceive and I literally remember lying in bed that night, going over all of the scenes in my head. In the past quarter of a century, more films have been added to this beloved franchise. The story has gotten more depth. We have been introduced to new characters and have said goodbye to old ones. The past 25 years have seen many changes to the theme park we were first introduced to in 1993. But, like with any great film series, this story transcends generations and now I can share these adventures with my own children. This is why I was so pumped to learn that the newest installment of my favorite dino-filled film is now out and available on Blu-ray. 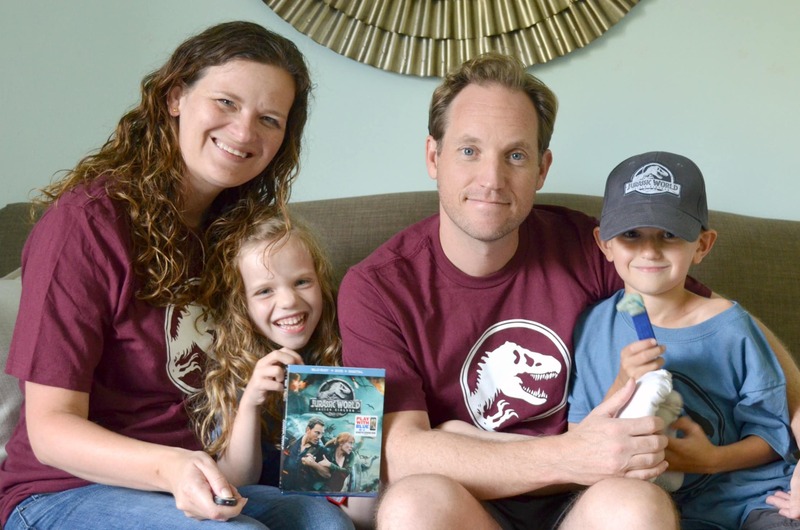 Jurassic World: Fallen Kingdom is now available to bring home to enjoy with the entire family. My 4th-grade son loves this franchise because he often “nerds out” on world history. What really attracts him to these films is that most of the creatures that he sees actually existed at one point in time. He can go back and research more about the dinosaurs that he sees in the movie. 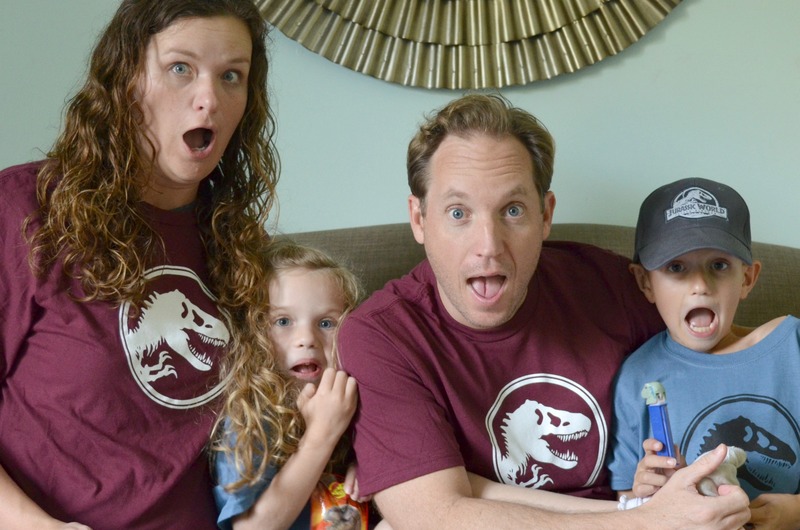 He really loved Jurassic World: Fallen Kingdom because it introduces us to more dinosaurs than any other Jurassic film. More dinosaurs definitely mean more adventure. And Jurassic World: Fallen Kingdom catapults this beloved franchise forward and leaves us wanting more and wondering where the next chapter could possibly lead. Now that the park is gone, what will happen? Where will all the dinosaurs go? Watch the movie and find out! 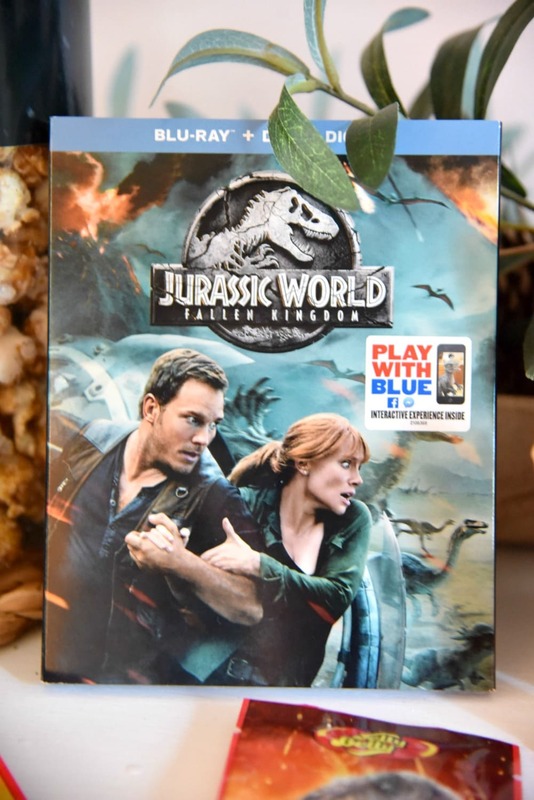 Also, the new release of Jurassic World: Fallen Kingdom on Blu-ray piles on the excitement even more with over an hour of bonus content included! As our children have gotten older, we have begun to really enjoy our family movie night. We turn down the lights, make a big bed on the floor in front of our television and grab some snacks. 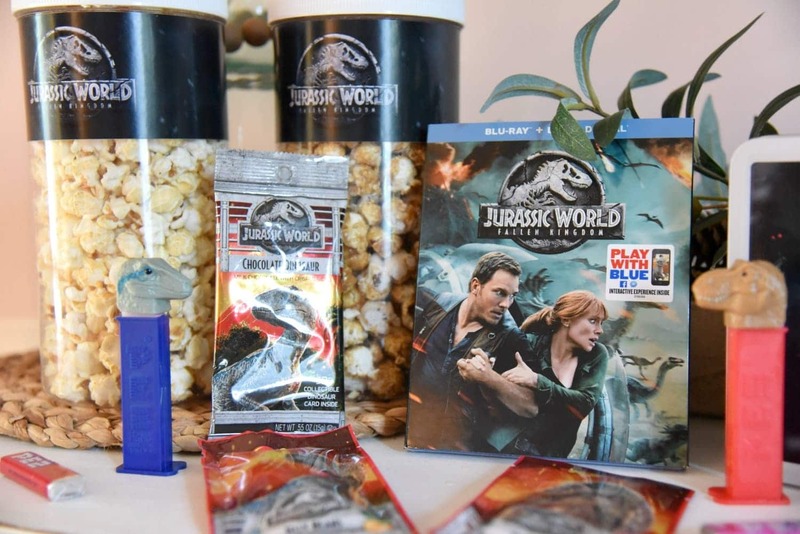 Jurassic World: Fallen Kingdom looks great on Blu-ray and, with my surround sound turned up extra loud, it felt like the action was all around us! There are a few keys to a successful family viewing party. First, snacks… any good viewing party needs good snacks. 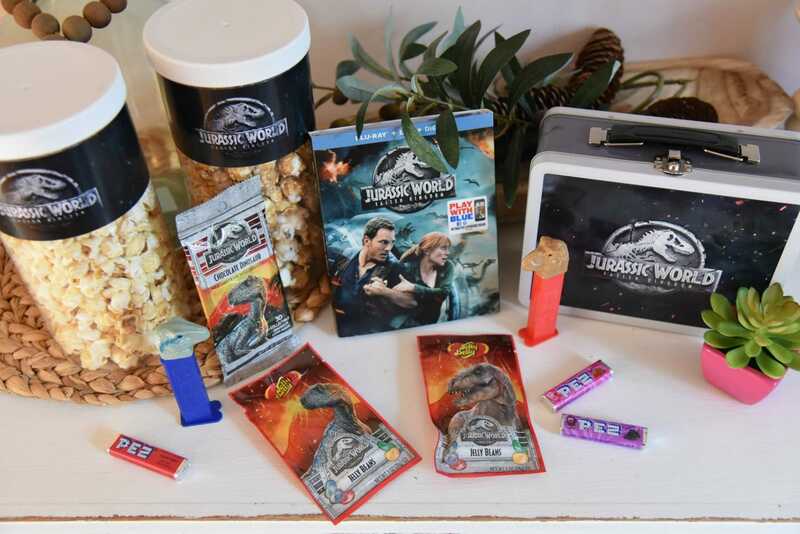 I am a sucker for a good theme and Jurassic World is perfect for breaking out all the fun dinosaur themed snacks and of course, you can’t forget about the popcorn. We had two different varieties, old-fashioned popcorn, and some dessert flavored popcorn. Looking for a good recipe? Check out our chocolate and peanut butter popcorn recipe. Whenever I can, I also love to incorporate a fun craft to get Caroline excited. Seeing as she is a little younger, I knew that she would love a handprint craft. 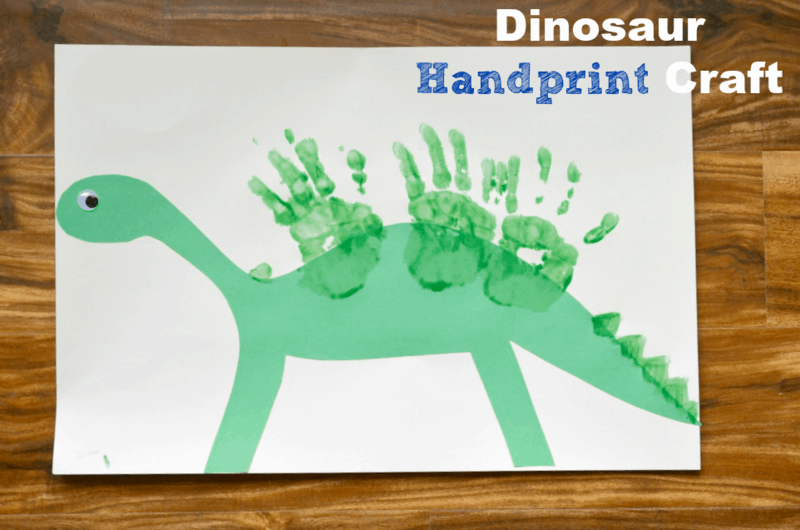 We made this dinosaur print using her handprints! It was a super easy dinosaur craft that she loved! Another key to a successful movie night is watching the bonus features on the Blu-ray! 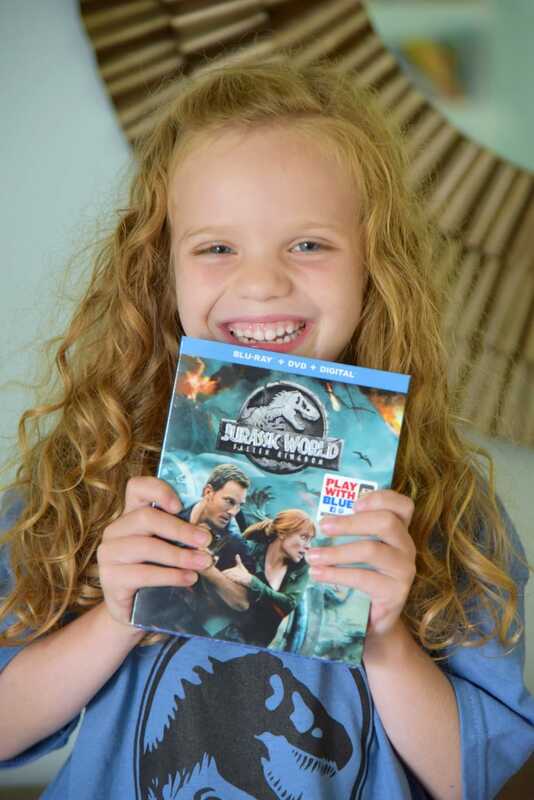 I love all the bonus content you get from the Jurassic World Blu-ray disks. Chris Pratt even gives us a behind-the-scenes look with his “Jurassic Journals”! The kids love seeing things from a new perspective.